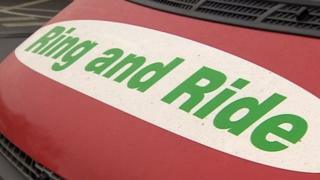 A firm which runs Ring and Ride services used by thousands of people in the West Midlands has gone into administration. Network West Midlands confirmed Accessible Transport Group (ATG) had gone into administration and would provide further details on Monday. "We are working with the administrators and the service continues to operate," Network West Midlands said. ATG has 900 staff and also transports children and adults with special needs. Birmingham City Council said it was "aware" the transport provider had gone into administration and said normal services would continue during the administration period. ATG describes itself on its website as the "leading provider of accessible transport services in the UK". It has more than 600 vehicles and 72,000 registered users for its Ring and Ride services in areas including Birmingham, Wolverhampton and Coventry. It transports about 2,800 children and adults between their homes and schools or colleges, and has contracts across the region, including with Warwickshire and Worcestershire county councils. The provider's igo bus services runs 81 vehicles on 43 routes in the West Midlands and Worcestershire, its website says, adding that this transports about 152,000 people a month.